As you well understood, to manufacture the highest quality of product, USANA always choose the highest quality of raw materials which meet our strict criteria. Unexpectedly raw materials price changes are continual from time to time, but we review and adjust prices at the beginning of every year to give your business the stability it needs. So it is the Time for 2016 Price Adjustments. Year 2016 adjustments will be effective January 30th. Updated price　lists will be provided ahead of time so you can identify the adjustment. Please notify your teammates and customers of the upcoming pricing adjustments. New Price List Effective January 30th 2016. All Auto Orders to be processed from January 30 will be adjusted accordingly. If you would like to make changes, please contact our Customer Service or change online by Friday prior to your Auto Order Cycle Week. Prices may change, but our commitment to you never waivers. Everything we do is focused on empowering you to find health and happiness—and share it with the world. January Seminar Schedule is available here. Product Advisor Lecture & Test in English will be held in February 2016. The date will be announced in January. Japan office is closed Wednesday December 30 through Friday January 1st. The Executive Director of USANA Health Sciences Research and Technology; Dr. John Cuomo had an interview from the well-known economic magazine in Japan; “Keizikai 「経済界」”. The interview will be in their New Year Edition to be released on December 22, 2015. To place an order, please place an Online Order or submit this Form by fax, email or office counter. This magazine (January 12th New Year Special Edition) will be on store from December 22nd (1 copy at 750 JPY). 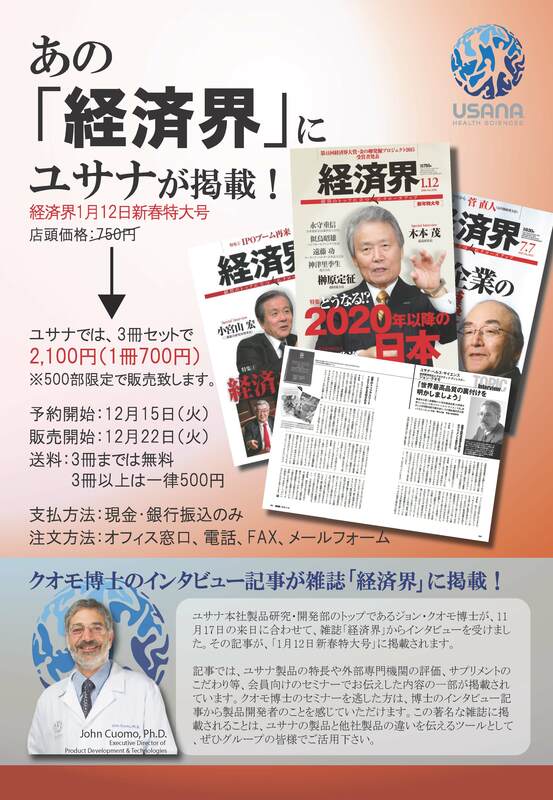 “Keizaikai「経済界」”means “Economic Industry”and this magazine has been published over 60 years. This is one of famous economic magazine which most readers are CEOs and top-executives. USANA will sell 500 copies! Price; 2100JPY for 1 set(3 copies). Most people share this magazine copies in the same group, we only sell per set. To place an order, please submit this Form by fax, email or office counter. Online reservation will start soon.